Here at The Malt Impostor John is the King of the Bourbons. Sometimes, when the spirits are upon us and feeling larkish, we call him Louis XIV, the most glorious Sun King of the House of the Bourbons. He’s worked hard to convince us of the glory of other grains, and with the Buffalo Trace, he scored big time. One waits for those rare precious moments when something new is unlocked; a formerly forbidden experiences opens in full splendor much like a sunrise blasting out rays that ricochet off of the pile of bling amassed by 50 rappers and their posse. And Mr. T.
On the nose, it’s runny ripe, plums on a super glossy mahogany highboy just replicated by Norm Abrams and waxed with tearose oil. It’s like jowl-drips on a dachshund and smells like American Gothic–and, no, I don’t know what that means. On the mouth, a rye-fed beefalo burger, whose interior is studded with butter-sodden barbecued smooth corn kernels, ultimately upstaged by the high hot rye buns and the vanilla soap scent on the impossibly gorgeous, clean-scrubbed, smooth-cheeked, all-American heartland honey serving you in a little Mom-and-Pop joint. Buffalo gals, won’t you come out tonight and dance by the light of the moon! Buffalo soldiers, in the war for America! Just imagine a genetically blended minature panda beefalo eating a jicama bamboo salad drizzled with warm, piquant distillate of Goddess. The finish begins with honied pepper (or peppered honey) and made my tongue salivate like a world-class schvitzer in an extreme sauna competition. Sonorous echoing Big Ben bonging jalapeno peppers, stuffed with aged Gouda, smoked by mesquite charcoal and cedar chips in the Big Green Egg. 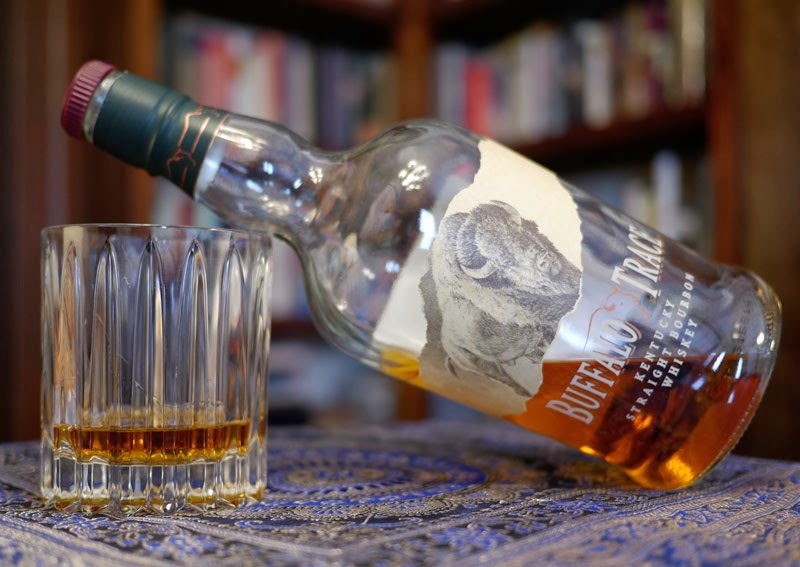 The Buffalo Trace is the elephazelle (yes, I made that up)–It’ll wrap it’s trunk around your neck, and then gracefully leap off, transporting a sinuously undulating you to imaginary mythic places where you’ll die in ecstasy after experiencing decades of unimaginable pleasures.